Drug candidates can be classified, according to the BCS system, into four groups on the basis of their permeability and aqueous solubility. Molecules with lower solubility tend to be more difficult to develop and are subject to closer scrutiny by regulatory bodies (e.g. FDA). Whilst formulation can address solubility deficits to an extent, designing clinical candidates with sufficient intrinsic solubility is generally preferred. The most widespread approach to improving solubility within a compound class relies on the introduction of hydrophilic groups in order to lower the log P (which generally correlates with aqueous solubility). However, this strategy is not always appropriate or possible and an alternative approach involves devising structural modifications which, by disrupting planarity and/or symmetry, lower crystal packing energies and reduce the energy barrier to dissolution in water. The examples presented in this paper clearly demonstrate the utility of this approach and the importance of considering these types of molecular modifications alongside the more classical introduction of polar, solubilizing groups. Increasing drug free fraction alone leads to decreased total concentrations in vivo and has a negligible effect on the free drug concentration. Increased drug free fraction will only increase free in vivo concentrations if hepatic clearance is also reduced. The use of shift assays to weed out compounds with high levels of protein binding can lead to the premature termination of good molecules. A better use of such assays is to determine the causes of the shifts observed (i.e. plasma protein binding or other factors). The diagram below summarises these points nicely, illustrating the key differences between the in vitro and in vivo situation with respect to the effects of plasma protein binding on free concentration. Increasing free fraction by 5-fold increases the unbound concentration by the same amount in vitro (total concentration is constant) but in vivo this increase is only observed when hepatic clearance is lowered (Scenario 1). When clearance is unchanged the total concentration is lowered (Scenario 2). The authors go on to discuss the relationships between protein binding and intrinsic clearance, lipophilicity, and half-life before turning their attention to tissue binding. The latter section looks at free brain concentrations in particular and makes the point that potency, the propensity for active efflux (e.g. P-gp), and hepatic clearance combine to have the biggest effect on efficacious clinical dose and that the free fraction in brain tissue is relatively unimportant. This paper complements the earlier one from Pfizer nicely and reinforces all the same messages. The empirical data included in the paper also nicely illustrates the points made by the authors. Structural Alerts – A comprehensive listing of documented alerts and referenced chemical intervention strategies (including partial or complete substitution of structure, addition of steric bulk, reduction of electron density, metabolic switching, and isosteric replacement). Assaying Reactive Metabolite Risk – An overview of the various in vitro (i.e. use of nucleophilic trapping agents and the assessment of covalent protein binding potential) and in vivo methods which are routinely used to assay the formation of adducts of drug-related metabolites. Bioactivation in the Context of Drug Discovery – A short section covering the interpretation of bioactivation and reactive metabolite data and the assessment of the associated clinical risk (i.e. dosage, usage, detoxification, metabolic route, route of administration). The article is well researched and presented and should serve as a useful and practical guide to this challenging aspect of drug design. In a recent post the difficulties of developing drug-like and CNS penetrant inhibitors of β-secretase (BACE-1 or ASP-2) were hinted at (a detailed account of the state of the art can be found in this book). Many of the reported inhibitors contain a central transition-state isostere flanked by fragments resembling the substrate peptide sequence and, as a result, the physicochemical properties of such molecules (i.e. relatively high MW, logP, PSA, and too many H-bond donor/acceptors) tend to result in inhibitors having poor pharmacokinetic properties and a high degree of P-gp mediated efflux from the CNS. Various groups have sought to address these issues by seeking novel, non-peptidic core templates (see this recent review for examples) either by fragment-based methods or by de novo structure-based design. A recent publication from Novartis describes an interesting example of the latter approach which is summarised graphically below: The key hydroxyethylamine motif (which mimics the transition-state during substrate hydrolysis and binds to both of the active site aspartic acid residues), found in many reported inhibitors, was retained but incorporated into a constrained, cyclic core. This core was then decorated with non-peptidic groups designed to access the S1, S3, and S2′ recognition pockets (the structural preferences of which are well documented and highly conserved). Whilst the S2 pocket was not targeted, a functional group X was incorporated into the core with a view to making additional interactions with the protein flap that usually binds over the substrate in the active site (this design approach is similar to that previously reported by DuPont with their cyclic urea, HIV protease inhibitors e.g. Mozenavir). The Novartis group sought to maximise the probability of obtaining CNS penetrant compounds by targeting an appropriate chemical space (MW<450, ClogP<4, PSA<90, H-bond acceptors<5, pKa<7). 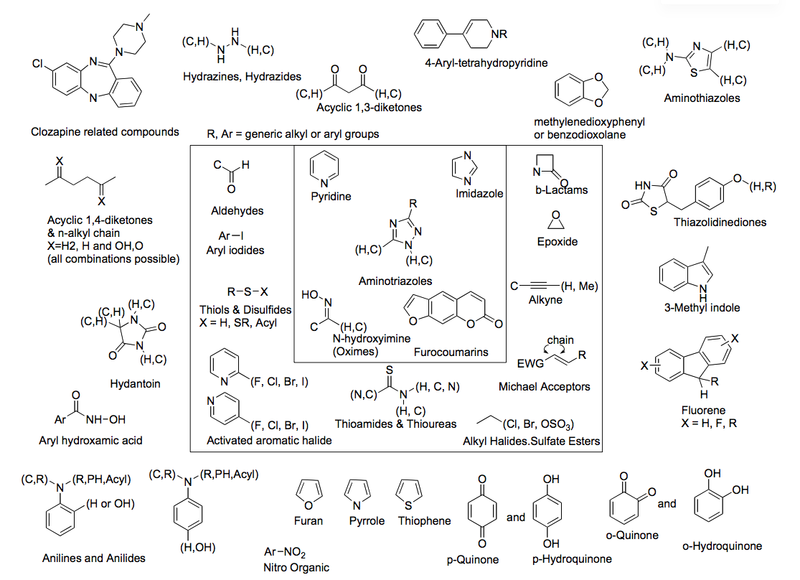 All candidate structures meeting these criteria were docked into the active site and ranked prior to synthesis. The two compounds shown below were two early compounds they prepared. Whereas the pyran oxygen was unable to form close interactions with the flap the analogous sulfone, which was 50-fold more active, was co-crystallised with BACE (PDB 3PI5) and observed to form optimal H-bonds to Thr72 and Gln73 as hoped. The aromatic substituents were also observed to make close hydrophobic contacts within the S1 and S2′ pockets and the sulfone had the added and desirable effect of lowering the pKa of the amine by just over 1 order of magnitude relative to the pyran. Initial attempts to optimise the potency of this series further by extending into the S3 pocket as originally intended were largely unsuccessful and the biggest improvements in potency were obtained by optimisation of the P2′ group (with t-butyl substitution being most potent, see 22c below). However, significant brain exposure was achieved when 22c was dosed i.v. in mice thus validating the design approach that was taken. The authors promise future disclosures of steps taken to further improve potency and address the low selectivity (vs Cathepsin D) and metabolic stability issues (22c had a half-life of 6 minutes in rat microsomes) associated with these early exemplars from this series. The introduction of fluorine in the course of a lead optimisation programme has become a key tool in the medicinal chemist’s armoury and many drug candidates incorporate one or more fluorine atoms. Two reviews published in 2008 in J.Med.Chem. and Chem.Soc.Rev. nicely summarise many of the key aspects attributed to the use of fluorine in drug design. Trifluoromethyl groups, being strongly electron-withdrawing and also often resistant to oxidative metabolism, can have dramatic effects on the properties of bioactive molecules. Until recently no general, mild methodology for the direct introduction of these groups was available and more often than not they were introduced by using appropriately substituted building blocks. Last year, Buchwald’s group published the first example of a palladium catalysed trifluoromethylation of aryl chlorides which went some way to addressing this deficit and now Xiao’s group in Shanghai have published an alternative complementary method in which aryl iodides are readily converted to the corresponding trifluoromethyl derivatives using the combination of a (trifluoromethyl)diphenylsulfonium salt and copper. The reactions proceed under mild conditions and the trifluoromethylated products are obtained in high yields. The methodology appears to be tolerant of a range of functionality and works well on heterocyclic systems (see examples above). The authors propose that CuCF3 is the active intermediate in these reactions and outline a possible mechanism for its production (see below) under the reaction conditions. Update (13/3/2011): A more recent protocol from Buchwald also makes use of a copper catalyst to promote room temperature aryl trifluoromethylation of boronic acids. Update (30/3/2011): Hartwig has now also published on the use of another copper-based reagent for the trifluoromethylation and perfluoroalkylation of aryl iodides and bromides. A new review, titled ‘Mechanisms of chemical carcinogenicity and mutagenicity: a review with implications for predictive toxicology’ , collates the experimentally derived mechanistic knowledge relating to this type of chemically induced toxicity. Whilst a lot of the material is well known to the medicinal chemist the article serves as a good introduction to the area and a useful reminder of the functionalities to avoid where possible (either by direct inclusion or via bioactivation). The review begins with some background to the area, and the general mechanisms of carcinogenicity, before then looking in more detail at specific functional groups (i.e. acylating agents, alkylating agents, intercalators, and aminoaryls) and their associated mechanisms of action. The last section of the review looks at the effects of structure on these mechanisms and the implications for predicting toxicity. Please feel free to add any additional links to papers covering similar material in the comments below. A link to the UK-QSAR and Chemoinformatics Group has been added to the MedChem Resources links. This site maintains a repository of slide presentations from the group’s meetings over the last decade. The slide packs are a little mixed in quality (as standalone documents) but a lot of them are very good and they cover quite a broad range of topics. Well worth a look! Furthermore, a number of RSS links to current vacancies in medicinal chemistry have been added at the bottom of the right-sidebar. Hopefully this will be of use to those of you currently looking for positions. The mitogen-activated protein kinase (MAPK) signalling cascade is one of the key pathways regulating cell proliferation and differentiation and aberrant activation of this pathway is implicated in a number of cancers. Targeting components of the cascade thus has the potential to provide therapeutic agents with broad antiproliferative utility, including antitumour activity. Allosteric inhibitors of MEK, in particular, have been the focus of much activity in the industry and a number of compounds (e.g. PD0325901 and AZD-6244) have progressed to clinical studies, with AZD-6244 currently most advanced and the subject of numerous trials. Two recent letters describe the identification of novel MEK inhibitors, TAK-733 and CH4987655, from Takeda and Chugai/Roche respectively. The papers are informative in that they describe the somewhat different approaches taken by each of these groups. Both groups started from PD0325901, or close analogues thereof, and sought to remedy the reported metabolic instability of the hydroxamate group in these compounds. The Takeda group used the published x-ray co-crystal data (PDB1S9J) of one such analogue to design alternative templates in which the amide was incorporated into a fused bicyclic core, thus reducing the propensity for hydrolysis and the conformational flexibility of the molecule. The pyridopyrimidinedione system (see A below), incorporating the known hydrophobic, 2-fluoro-4-iodoaniline binding motif, appeared to provide a good fit with the allosteric site and the extra carbonyl group had the potential to form an additional H-bond to Val 211 and/or Ser212. Indeed, when prepared, this compound had very encouraging enzyme activity (IC50=26 nM) and provided the basis for a more detailed SAR exploration which in turn led to the discovery of TAK-733. The introduction of a polar sidechain allowed for additional interactions with Lys97 and the ATP phosphate, and presumably also modulation of physicochemical properties (although the paper doesn’t comment on this aspect), and an additional fluorine substituent also seems to have been beneficial with respect to potency. TAK-733 is highly potent (IC50=3.2 nM) and selective, has excellent PK in preclinical species, and has potent anticancer activity in various mouse xenograft models. The compound is suitable for once-daily oral dosing in humans and appears to be the subject of an ongoing trial. The team at Chugai took a slightly different approach and chose to protect the hydroxamate group from hydrolysis by introducing substituents which would perturb the interactions with metabolising enzymes. They found that substitution (see PD0325901) in the 5-position was well tolerated and compounds of the general formula B had good potency and, as hoped, improved metabolic stability of the hydroxamate side-chain (relative to PD0325901 and analogues thereof). Further cycles of optimisation led to CH4987655 (see below), a potent and selective MEK inhibitor with good activity in xenograft models (particularly in combination with mTOR inhibitors), and a favourable PK profile in human volunteers. Interestingly, the authors also point out that CH4987655, in contrast to PD0325901, does not inhibit MEK in the brain (due to limited distribution from plasma) presumably with the intention of implying (although not explicitly stating) that this may have some bearing on some of the apparently centrally mediated side-effects noted with PD0325901. CH4987655 (redesignated as RO4987655) is also currently the subject of an ongoing clinical trial. The triptan drugs have been highly successful in the treatment of migraine, but adverse effects and low responder rates in some patients have provided the impetus to develop alternative therapies. Blockers of the calcitonin gene-related peptide (CGRP) receptor have emerged as promising alternatives to the triptans. Merck’s telcagepant has demonstrated efficacy comparable to the triptans in clinical trials and this novel mechanistic approach may offer relief to patients who do not respond well to triptan therapy. Concerns over raised liver enzymes (alanine transaminase, ALT) in prophylactic trials have hampered development of telcagepant but other molecules with different properties may address this issue. Merck scientists have previously published papers describing the discovery of telcagepant (MK-0974) and a backup (MK-3207) and have now disclosed some additional work on related compounds in a recent letter. In attempting to improve upon telcagepant (MW=566) they sought to identify compounds with lower predicted clinical doses. They hoped to achieve this by replacing the caprolactam amide with heterocycles (to enhance solubility and lower plasma protein binding) and by identifying right-hand side replacements for the azabenzimidazolone group with improved metabolic stability. To date, the optimisation of ligands for the GPCR receptor has proved to be non-trivial with most potent antagonists being of relatively high molecular weight. The data reported in this paper continues this theme and obtaining the right balance of properties in a limited chemical space proved to be very difficult. Overall, a spiro-azabenzoxazinone (see 30 above) on the right-hand side gave compounds with the best pharmacokinetic profiles and an appropriately substituted imidazole, as the caprolactam amide isostere, gave the best balance of potency, bioavailability, and hERG selectivity. This culminated in the discovery of MK-2918 which, whilst heavier (MW=580) and more lipophilic than telcagepant, had respectable preclinical properties and improved in vivo efficacy. In addition, increased stability in human microsomes relative to preclinical species and, interestingly, the high potency of it’s primary metabolite (the tertiary alcohol obtained by demethylation of the ether in 30) combined to give a lower anticipated clinical dose of MK-2918 relative to telcagepant. It’s not clear whether this compound has actually been progressed to the clinic or how straightforward developing a compound with this sort of profile would be. Hopefully some additional information relating to the progression of this molecule will be forthcoming in due course. Investigators at Roche recently published a communication describing a systematic study of halogen bonding effects in protein-ligand complexes of human Cathepsin L (hCatL). 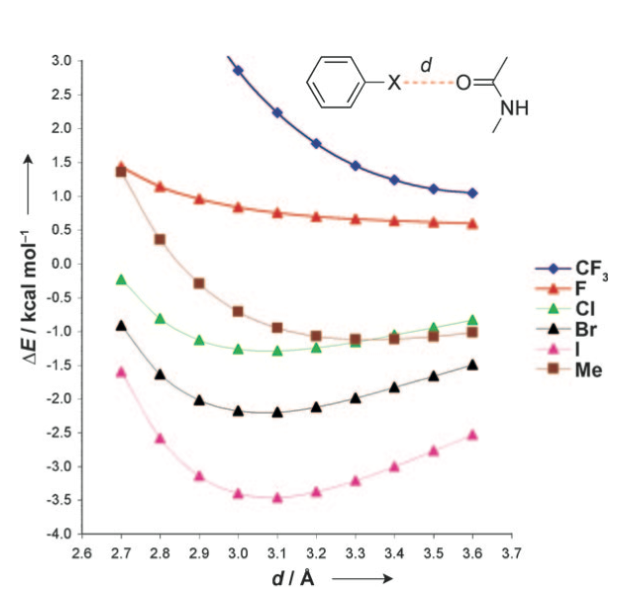 They found that an inhibitor incorporating a 4-chlorophenyl moiety enhanced binding affinity by a factor of 13, relative to the unsubstituted analogue, and x-ray cocrystal data suggested that the Cl atom made a favourable bonding interaction with a backbone CO group (see figure below). This prompted them to prepare an array of analogues designed to explore this finding more comprehensively. Whilst this type of protein-ligand interaction is not unprecedented the study the authors describe is the first of its kind to be reported in the literature (see note below) and makes for interesting reading. The data they present, along with comparative calculated interaction energies, argue that halogen bonds in protein-ligand complexes can contribute as much to binding affinity (and binding selectivity) as is the case for hydrogen bonds. They demonstrate that the halogen bonds have strict geometrical requirements and that they increase in strength (all other factors being equal) with the mass of the halide substituent (Cl<Br<I) – with the exception of fluorides which are unable to interact in the same way. They suggest, on the basis of their results, that establishing an ideal halogen bond might enhance protein-ligand affinity by as much as 74-fold (i.e. 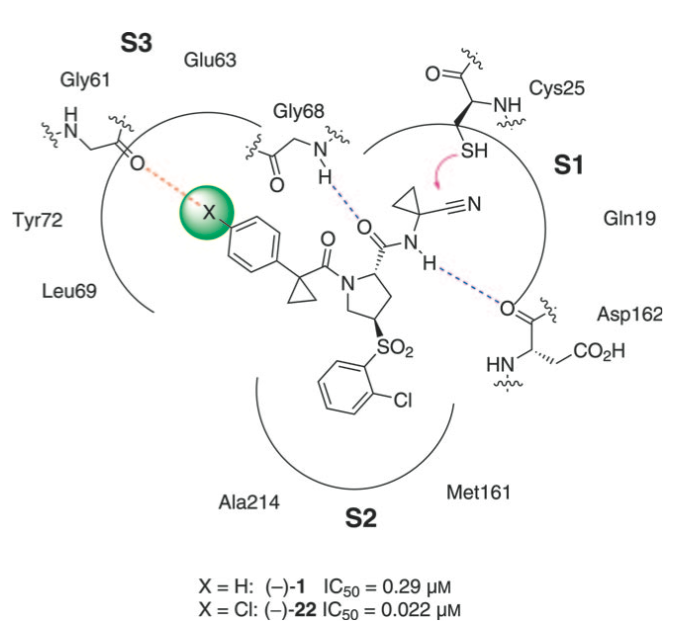 -ΔΔG = 2.6 kcal/mol) and that targeting such interactions to enhance protein-ligand binding affinity will increasingly find utility amongst medicinal chemists. Note: A reader recently drew our attention to an earlier publication, from a Chinese group, in which they looked at a number of halogenated ligand-protein complexes and carried out single-point energy calculations to arrive at very similar conclusions to those outlined above. They also highlighted the potential for using this type of interaction in drug design.